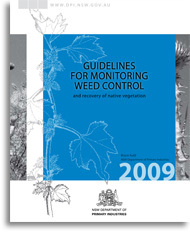 Weeds have an impact on agriculture at farm, region and industry level. Newly invading species, weeds that are spreading and widespread established weeds are all important. Weed management may take the form of prevention of invasion, containment of spreading populations or control of widespread weeds to protect assets such as crops and pastures. Whatever the strategy adopted, it is important to assess the success of weed control in order to make the best use of time and money and to modify management programs as necessary.